Some of the top traits listed for men are also mentioned as characteristics that society values most in women, but by significantly smaller shares. About one-in-ten say society values ambition, leadership or assertiveness (9%) and a good work ethic (9%) most in women; just 5% mention strength or toughness. In fact, 28% volunteer traits related to ambition, leadership and assertiveness when asked what qualities people in our society believe women should not have, far more than cite any other trait or characteristic. 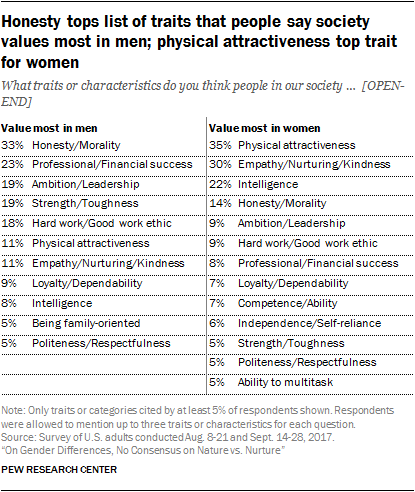 When it comes to what society values most in women, traits associated with one’s physical appearance are among the most often mentioned: 35% volunteered something having to do with physical attractiveness or beauty. Three-in-ten say that society values being nurturing and empathetic most in women, including 11% who specifically mention being a parent or caregiver and 6% who mention traits like kindness or being helpful. By contrast, significantly smaller shares of Americans say that society values physical attractiveness or being nurturing or empathetic most for men (11% each). When it comes to traits or characteristics people in our society believe men should not have, no response stands out: Somewhat similar shares say most people in our society believe men should not be emotional or sensitive (15%), intolerant (11%), ambitious, assertive or a leader (11%), weak or vulnerable (11%), or dishonest or immoral (10%). 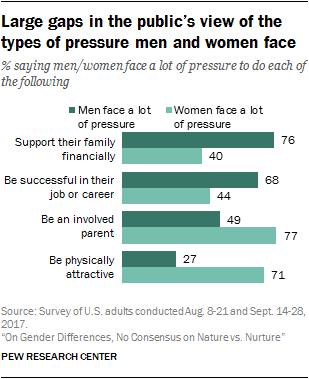 When asked about the extent to which men and women feel pressure in different realms of their lives – from jobs, to family responsibilities, to personal appearance – the public sees clear gender differences. In particular, far higher shares say men face a lot of pressure to support their family and to be successful at work. And while solid majorities say women face a lot of pressure to be an involved parent and to be physically attractive, about half or fewer see these as pressure points for men. About three-quarters of Americans (76%) say men face a lot of pressure to support their family financially, compared with 40% who say the same about women. 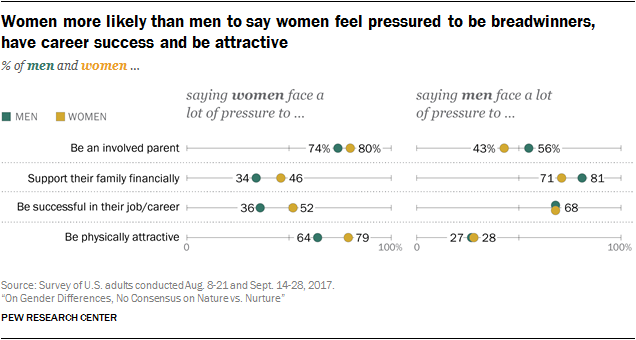 And while about two-thirds (68%) say men face a lot of pressure to be successful in their job or career, fewer than half (44%) say women face the same type of pressure. By contrast, far larger shares of the public say that women are pressured to be an involved parent and to be physically attractive. Most Americans (77%) say women face a lot of pressure to be an involved parent; 49% say the same for men. Roughly seven-in-ten (71%) say women face a lot of pressure to be physically attractive, but just 27% say the same of men. There are some gender gaps in views about the pressures faced by men and women. By double-digit margins, women are more likely than men to say women face a lot of pressure to support their family financially (a 12-percentage-point gap), to be successful in their job or career (16 points) and to be physically attractive (15 points). Large majorities of men and women agree that women face a lot of pressure to be an involved parent (74% and 80%, respectively). At the same time, men are more likely than women to say that men face a lot of pressure to be an involved parent (a 13-point gap) and to support their family financially (10 points). Similar shares of men and women say that men face a lot of pressure to be successful in their job or career and to be physically attractive. There are also gaps along educational lines in assessments of the pressures men and women face. About half of adults with a high school diploma or less (49%) say women face a lot of pressure to support their family financially, compared with 36% of those with some college experience and 31% with a bachelor’s degree or higher. Similarly, 48% of those with a high school diploma or less say women face a lot of pressure to be successful in their job or career, compared with 40% of those with a bachelor’s degree or higher (43% with some college experience say the same). By contrast, those with at least a bachelor’s degree are more likely than those with less education to say women face a lot of pressure to be an involved parent or be physically attractive. For example, 84% of adults with at least a bachelor’s degree say women face a lot of pressure to be physically attractive, compared with 73% of those with some college experience and 60% with a high school diploma or less. When it comes to pressures men face, adults with a bachelor’s degree are more likely than their less-educated counterparts to say men face a lot of pressure to be successful in their job or career, but they are less likely to say men feel pressured to be an involved parent or be physically attractive. Three-quarters of adults with at least a bachelor’s degree say that men face a lot of pressure to be successful in their job or career, compared with 68% with some college experience and 62% with a high school diploma or less. By contrast, 61% with a high school diploma or less say that men face a lot of pressure to be an involved parent, compared with 46% with some college experience and 38% with at least a bachelor’s degree. About a third of adults with a high school diploma or less (32%) say men face a lot of pressure to be physically attractive; 28% of adults with some college experience and 20% with a bachelor’s degree or higher agree. Most adults across all educational groups say that men face a lot of pressure when it comes to supporting their family financially. While Republicans and Democrats generally agree on how much pressure men face in these different areas, Democrats are more likely than Republicans to say women face a lot of pressure in each of these. For example, 49% of Democrats and Democratic-leaning independents say women face a lot of pressure to be successful in their job or career, compared with 38% of Republicans and those who lean to the GOP. And while majorities of Democrats and Republicans say women face a lot of pressure to be physically attractive, Democrats are more likely to say this is the case (77% vs. 65%). In recent years, research looking at the messages boys and men get from society about what it means to “be a man” has received increased attention. The survey asked men how much pressure they think men in general face to do each of the following: be emotionally strong, be interested in sports, be willing to throw a punch if provoked, join in when other men are talking about women in a sexual way, and have many sexual partners. Most men say men face at least some pressure to be emotionally strong (86%) and to be interested in sports (71%). About six-in-ten (57%) say men face pressure to be willing to throw a punch if provoked. Smaller but substantial shares say men face at least some pressure to join in when other men are talking about women in a sexual way (45%) and to have many sexual partners (40%). Millennial men are far more likely than older men to say men face pressure to be willing to throw a punch, to join in when other men are talking about women in a sexual way and to have many sexual partners. 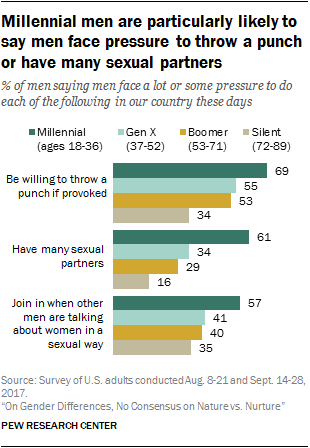 About seven-in-ten Millennial men (69%) say men face at least some pressure to throw a punch if provoked, compared with 55% of Gen Xers, 53% of Boomers and 34% of men from the Silent Generation. When it comes to having many sexual partners, 61% of Millennial men say there is at least some pressure to do so, compared with 34% of Gen Xers, 29% of Boomers and 16% from the Silent Generation. And while 57% of Millennial men say men face pressure to join in when other men are talking about women in a sexual way, about four-in-ten or fewer men in other generations say the same. There are no significant differences in the shares of men across generations who say men face at least some pressure to be emotionally strong or be interested in sports. Unmarried men are more likely than those who are married to say men generally face pressure to have many sexual partners (47% vs. 32%) and to join in when other men talk about women in a sexual way (52% vs. 38%). Still, among those who are married and those who are not, Millennial men are more likely than their older counterparts to say men face at least some pressure in these areas. For the most part, white, black and Hispanic men share similar views about the pressures men face, but black and Hispanic men are more likely than their white counterparts to say men face at least some pressure to join in when other men are talking about women in a sexual way (54% of black men and 56% of Hispanic men vs. 42% of white men). And while majorities of white, black and Hispanic men say men face pressure to be interested in sports, blacks and Hispanics are more likely to say this is the case (81% and 80%, respectively, vs. 68% of whites).